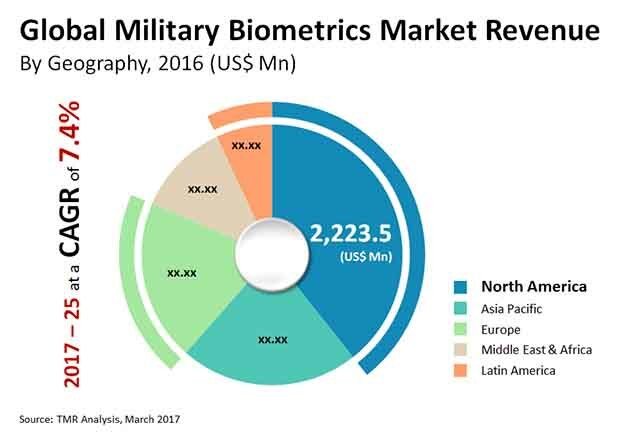 The competitive scenario of the global military biometrics market is intense and extremely competitive and Transparency Market Research (TMR) in its latest report predicts that the competition will gain more momentum in the years to come on account of new players entering in the market. These new players could possibly cause ripples among the large pool of existing global players. The top five companies within the global military biometrics market are: Crossmatch, Safran, M2SYS Technology, 3M Cogent, and NEC Corporation. These five companies collectively held a whopping 61% of the market in 2016. Leading players are engaging in the development of new products so as to gain competitive advantage among other players. Players are increasingly investing in research and development so as to come up with products that are technologically advanced. Players are also working closely with end users, software integrators, and resellers so as to make most of the opportunity in hand and enhance the return on investment. According to a TMR, the global market for military biometrics will be worth US$10.62 bn by 2025, expanding at a 7.4% CAGR from 2017 to 2025. By geography, Asia Pacific will emerge as a lucrative region. Europe and North America collectively accounted for 55% of the market in 2016. North America is anticipated to lead in the market for the rest of the forecast period driven by the growing concerns over illegal migration in the U.S. On the basis of type, the market is expected to be led by the fingerprint recognition segment. Facial recognition segment is also anticipated to witness a steady growth in the years to come. A TMR analyst said that, “the demand for military biometrics is anticipated to increase in the coming years on account of the growing demand for advanced technology so as to fight terrorism. With growing need for addressing infiltration and similar security issues, it has become utmost important to adopt military biometrics. The growing number of nations struggling with forged identities, identity thefts, and illegal immigrations will spur a heightened demand for military biometrics. More and more airports and borders across countries are making use of biometrics authentication systems in a bid to reduce terrorism and terror attacks. On the other hand, the complexity of military biometrics systems could be a challenge. The high cost may also be a deterring factor for large scale adoption. In addition to this, the installation of these systems is complicated and requires skilled personnel. The fact that it involves security of highly confidential data, necessitates for the system to never be compromised and as this system cannot be reset easily, it is a big factor for reduced adoption. However, the continuous technological advancements in this field is estimated to reduce the impact of this restraint.